I am working on an NES-inspired platformer in Java 1.6 and libGDX. Currently developed in OSX and testing in Windows as well as android 2.2+ mobile devices. I currently have an artist I am contracting art from. The rest of the awesomeness comes directly from me. The game is very sarcastic and humorous. It starts out with the main character pouring batter into bowl in kitchen (there will be art-boards in the intro scenes). In the next screen he exclaims "Shiat, out of milk!" while rushing out of door -- fridge open in background. Then it shows the character running towards town in the distance. This is the entire premise of the game. When the player arrives in town, he'll learn that although most of the town is accessible, the grocery is not accessible due to a bridge being out. The game will consist of the player obtaining parts to fix the bridge so that he can get his milk and finally make his waffles. It seems like something or someone really doesn't like waffles.. hrm.. The town will consist of buildings (much like the towns you are familiar with). Each building is actually a "world" and will be quite large and have many inside, underground, and outside areas. Each "world" will have a list of "tasks" to complete -- which you will see when standing near the house's door. Completing all tasks will unlock the final task for that world, which will net you the piece of bridge you are looking for. Initially one house is accessible, but the next house becomes accessible as soon as the first task of the previous house is completed. The player will not be able to linearly complete all tasks at each world due to need of items or skills found in other worlds; so the player has to experiment and think about what paths his newly obtained loot will open up. Gameplay style is of course platformed style, with a bit of RPG mixed in (no leveling or EXP, but there will be projectile and melee fighting). 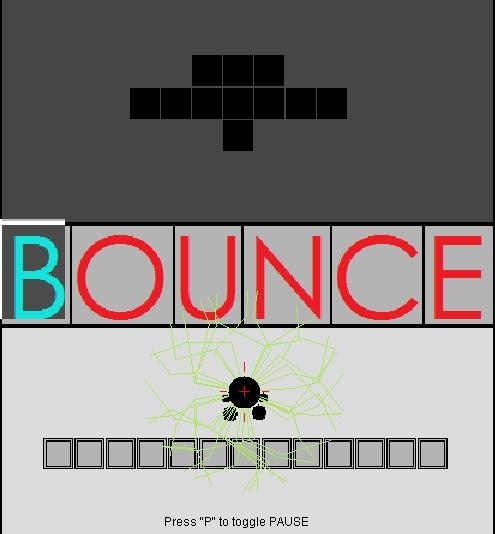 There is also physics (Box2D), but the physics is downplayed and no puzzles will explicitly rely on physics (as I personally hate those types of games). I'm hoping to have at least 15 hours of gameplay (meaning 15 hours to complete if you know what you are doing) so this isn't something that I'll have finished next month of course. I just don't know which keys to press. I've almost tried out everything. Enter and the Up/left/right keys had effect. I was able to get into the house and able to get some of those blue discs. Pretty good graphics! I know it's that specific graphics style, but I would have liked less contrast in the woods. There's a lot of game left to be done, but I've spent a good 50 hours on it so far. If you look at your task manager you should see no leaks, and it should not crash (assuming theres no computer-specific issues). I've got a very clean codebase and will continue to add features, weapons, and enemies before finally working on stages and content. Thanks for trying it out though! And by contrast in trees, do you mean the darker shade? Thanks! I will be releasing the next demo later on next weekend. I'll be working on a lot of updates between then and now. I'm making it a point not to watch TV or play other games to ensure I don't get sidetracked with this project. If anyone has any suggestions or tips as I move this project along please let me know -- I know there's not enough here for tips now, but certainly in the future. Looks cool (building graphics very reminiscent of Zelda II! ), but unfortunately it's unplayable for me. The screen constantly flickers white (like a refresh problem, clearing the screen perhaps?). The game is running though - I can move around, jump, hit blocks and collect things. This was on Vista. I didn't see a stack trace or a log written anywhere. After doing some refactoring i've moved rendering from the canvas to the jframe itself, this should resolve the flickering issue. I don't clear the screen ever, so white is the frame itself being painted on top of the canvas for some weird reason. I've also changed input from overrides to key listeners, among other things. The release I do this saturday/sunday should be free of these issues (and input issues others were having) among many updates. I've spent about 15 hours this week doing absolutely nothing but refactoring, commenting, and testing my existing logic before moving on. Now that my work week is over I'll be spending all of tonight and some of tomorrow writing a map editor as things are getting too complex for my little stage data tricks. I'll also be adding in at least one weapon and several types of enemies (1 flying, 1 'dumb' ground, and 1 'smart' ground unit) and hopefully some more fleshed out maps. Thanks so much for trying it out, and if someone on window that has video problems wants to more actively help me get those issues solved please let me know; I don't run into them here and cannot debug/test something I don't see. I just saw on another post a tool called Tiled Map Editor and it appears to do everything I need it to, so it may save me a LOT of dev time.. We'll see! I'll be happy to try out another build when you have one. And yes, Tiled is pretty awesome. I have completely implemented the map editor stage file now, complete with tilesets, collision regions, objects, items, enemies, and warps. It's nice that it compresses the tile data into base64 encoded gzip stream. I just wrote my own loader as it was only a few hundred lines of code anyway. Doing that required me to completely re-think how I handled the initial startup state (what stage to load first, where to put player initially, etc). All these issues have been resolved (my main stage manager xml file is simply a list of <property name="" value="" /> tags for needed things) and as we speak I am working on some new tiles and then will add a few enemies. It's looking like I may be pushing a new release a day early thanks to this map editor; it's friggen great. Hmm... I have got some kind of error, I just see a flashing black screen. Any help?? Just some new screenshots. Lots of internal bugfixes. Maps are loading via Tiled now instead of via pixel data in images and external XML. Changed root xml file to simply hold properties to kick off the game when you start playing. I just finished adding the first enemy character and am now working on attacking logic for players and the first enemy. It's still looking good for a saturday night release with loads of updates! Looks great! You might want to switch to Java 6 in order to increase compatibility. From what I've heard, you should only use Java 7 if you really need to (like string switches, FileReader stuff, etc.). Well, where is that new version? I want to play it! It's coming tonight, no worries! I've finally contacted a real artist and will be getting some tile work, portraits, and scenes done soon as well. I've finalized a name for the game as well as the intro story as well; but I am not going to reveal it currently. Anyway, release coming tonight as planned around 10pm EST. Java 6 will be end of life before too long. I use a lot of the features of Java 7, including string switches in the loader routines. IntelliJ IDEA 12 CE on Mac OSX for development, Tiled for map editor, and Pixen for graphics (until the artist does the final art). I got intelliJ IDEA in the end of the world sale! Posting my test AI character. She walks around, stands, has physics, and reacts to the environment and player. Still trying to get her attacking AI in before release tonight. I also spent a lot of time updating the subtle feel of moving the character. Now you will walk, and can run by pressing (Z) and jump by pressing (X). The general feel is a bit more fluid and smooth now. Still flickers like crazy on my machine (Windows 7 64Bit, Geforce 680 GTX (latest drivers), Java 1.7.0_09). And the sound loops endlessly after closing the game window...very annoying, i've to reboot now to stop that. I had several people test it on IRC and they had no issues, if you get the time do you mind jumping on IRC or google chat (tim.sarbin@gmail.com) so that I can try to figure out what it is about your setup that is causing issues? I tested in a VM, on OSX, and had someone test on XP and 7 and all of those worked. I'll also hit the googles. Sound hanging is an issue - due to the audio system I use to play the SID files. The source is in german so it may be a few days before I sort that issue out For now I'm sure you can kill java from the task manager to kill it out. OK I may have figured out the flickering problem. The change made things run butter smooth on my computer (never noticed until I saw the change). I will do a new release after I attempt to figure out the audio hang issue. Let me know if you run into any issues. This REQUIRES Java 1.7, it will not run with Java 1.6. I have tested the exe version in a virtual machine and it ran fine, so hopefully you guys will not have any issues this time around. [Up/Down arrow keys] Navigate options in main menu. The thread manager now dumps all threads (including audio) when the window is destroyed, so this should stop sound hanging. Also changed how the rendering system grabs buffers which hopefully will fix flickering issue for some of you.. we'll see I guess. No more flicker for me, congrats. Glad other people like writing retro, 8-bitish games! Flickering is gone now, but the sound continues to loop after closing the window. There's no Java process to kill, it's just the sound looping endless. I'm in the process of moving to libgdx now, and will be dumping the SID files to standard audio streams, so next release should be a lot less annoying for you. Really strange you still had the issue as I nuked the thread pool on shutdown. Either way, won't be an issue for long.